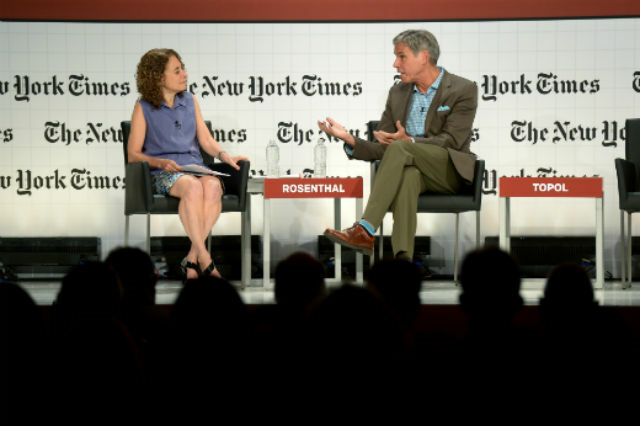 The role of data and technological innovation in health care was front and center at a conference of top health experts from academia, industry and government, convened by the New York Times at the University of California, San Francisco yesterday. Voices of both optimism and caution were plentiful, but the discussion of technology was consistently grounded, no matter the speaker’s view, in the cost of health care. “I have a 2011 car, and I’m happy with it. It doesn’t have all the latest technology. I don’t have a GPS system,” said Peter Bach, director of Memorial Sloan Kettering’s Center for Health Policy and Outcomes. Bach argued we should be providing and paying for health care with similar tiered standards and choices, not simply assuming that the latest and most expensive technology is warranted. Kaiser Permanente CEO Bernard Tyson said it’s not acceptable to shift the cost of health care onto the backs of Americans who haven’t seen a wage increase in 15 or 20 years. And as we’ve seen from exposés about prostate cancer treatments, which Xconomy columnist Stewart Lyman discusses here, high-priced healthcare “innovations” can do more harm than good, literally adding injury to financial insult. Throughout the day, discussions and Q&A sessions highlighted the tension engendered by technology. Eric Topol, who wears several hats at the Scripps group of institutes in San Diego, including director of the Scripps Translational Science Institute, made a pitch that technology such as genome sequencing and mobile monitoring will drive costs lower and make medicine personalized—or as he calls it, “individualized,” a term he uses to highlight the need for the individual to take better control of health care decisions. A practicing cardiologist, Topol has some patients use a wireless cuff to measure heart rate, which is analyzed by a smart phone app. A patient can alert him if there are serious irregularities. Many lab tests can, or will soon be done via remote monitoring, he said. But even while stumping for a warmer embrace of new tools, Topol blamed overuse of some medical technology, such as high radiation CT scans, on physicians’ unwillingness to properly inform their patients. Not enough technology? Too much technology? Either way, doctors seemed in Topol’s crosshairs. Great to see you lead with Bach’s car model-year insurance analogy. That one quick line of his was the star of the show for me, yesterday. Turns out there is someone who has made a very robust proposal in this vein: Russell Korobkin of UCLA law school. I’ll save the specifics, but he proposes something called “Relative Value Health Insurance”, and it is a way to address the issue of consumer demand, risk tolerance, and bounded rationality all in one neat package.